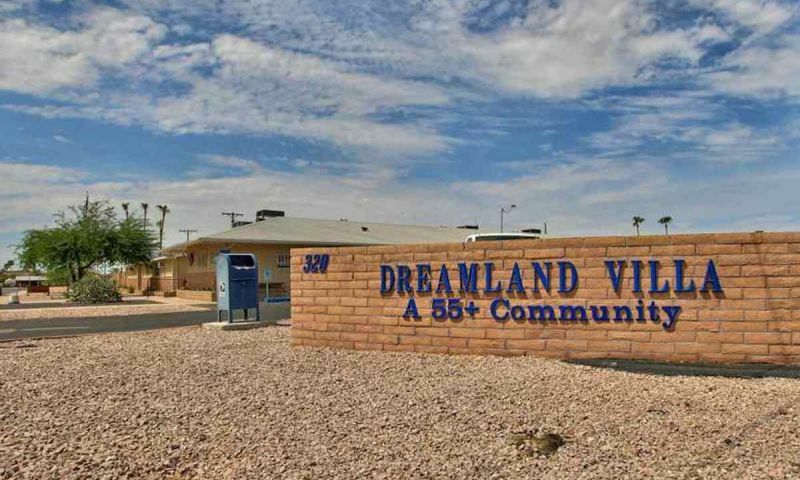 Dreamland Villa is an established 55+ community in Mesa, Arizona. This active adult community features affordable homes, two clubhouses, and a large variety of social clubs and activities. With over 2,000 homes built inside of Dreamland Villa, homebuyers have a wide selection of home layouts available on a resale basis. With its popular location in the Phoenix area, Dreamland Villa is close to prime destinations, major airports, and large shopping centers. Owning a low-maintenance home in Dreamland Villa means having the time to relax and enjoy moments with friends and family. Dreamland Villa offers its residents all of the amenities that one would expect in an active adult community. There are two clubhouses: Read Hall and Farnsworth Hall. Read Hall s clubhouse is a complex that hosts most of the community s indoor activities. Read Hall is complete with amenities that cater to residents' many hobbies including a woodshop, ceramics studio, game room, art studio, exercise room, and lapidary studio. There is even a meeting room that can host 150 people, a library, and on-site dining at John s Villa Restaurant. Just outside of Dreamland Villa s Read Hall, residents enjoy two outdoor pools and courts to play pickleball and shuffleboard. Farnsworth Hall is a wonderful place to watch a performance or attend a party. This hall includes a large auditorium that is complete with a stage. Residents often come here for arts and craft shows, dances, potluck dinners, concerts, and plays. This complex also has an outdoor pool, horseshoe pits, and bocce ball courts. Taking advantage of the warm climate, Dreamland Villa s Farnsworth Hall has an outdoor amphitheater that hosts programs outside. More outdoor amenities can be found at Dreamland Villa Golf Club. After nine holes of golf, the caf is a great place to grab a bite with friends. There are even chipping and putting greens for practice. Dreamland Villa s one-mile Desert Nature Walk can also be found within the community and it s a great place for dog walking, sightseeing, and light hiking. Dreamland Villa began construction in 1959 and in 1978 Farnsworth s development was complete with 2,732 homes for active adults. This community is home to many different floor plans that offer approximately 942 to 1,910 square feet of living space. Homes range from one to three bedrooms and one to two bathrooms. Every residence within the community has a carport and is single story. Residents of Dreamland Villa enjoy their active and social lifestyles. Residents who want to focus on socializing with neighbors enjoy attending events at Farnsworth Hall, playing games in the game room, attending monthly potluck dinners, joining a book club, or singing in the sing-a-long group. Some outdoor activities include golf leagues and pickleball. Dreamland Villa also promotes health and exercise by offering aquacise classes, blood pressure checks, bowling, and aerobics. Clubs that focus on quilting, lapidary, photography, woodcarving, and arts are great for crafty residents. With so many happenings in and around Dreamland Villa, an activities director keeps a calendar handy for residents to pick their favorite pastimes. Dreamland Villa enjoys a convenient location in Mesa, Arizona. Shopping, dining, and everyday services can be found just 10 minutes away at Superstition Springs Center Mall. Homeowners enjoy having access to over 150 retailers that range from electronics, department stores, and restaurants just a short drive away. Traveling to Phoenix s attractions is an easy 30-minute drive with the community s location just north of I-10/US-60. Residents have the choice of two airports when traveling: Phoenix Sky Harbor International and Phoenix-Mesa Getaway. With an abundance of amenities, conveniences, and affordable homes it s easy to see why Dreamland Villa is a favorite community in Mesa. Read Hall is located at 320 N. 55th Place and is home to most of the community's indoor activities. This is one of two amenity centers available to Dreamland Villa's residents. Farnsworth Hall is located 6159 E. University Drive and is a popular location to watch plays and attend parties. Both amenity centers are available to all residents of Dreamland Villa. Dreamland Villa Golf Club is a public golf course. Residents enjoy the great outdoors and nature viewing Desert Nature Walk. There are plenty of activities available in Dreamland Villa. Here is a sample of some of the clubs, activities and classes offered here. 2,732 single-family ranch homes were developed in Dreamland Villa between 1959 and 1978. There were many floor plans designed that offer approximately 942 to 1,910 square feet of living space with one to three bedrooms, one to two bathrooms, and a carport. Please note: not all floor plans are pictured below. The houses here are inexpensive and the folks are friendly. It's older but still has a lot of life and my neighbors are great. I am active in community clubs and walk the nature trails almost every day. It's a nice, quiet community. 55places.com is not affiliated with the developer(s) or homeowners association of Dreamland Villa. The information you submit is distributed to a 55places.com Partner Agent, who is a licensed real estate agent. The information regarding Dreamland Villa has not been verified or approved by the developer or homeowners association. Please verify all information prior to purchasing. 55places.com is not responsible for any errors regarding the information displayed on this website.